Energizes your skin for an all-day glow. A light and silky cream, Himalaya Herbals Energizing Day Cream is power-packed with Thatch Grass and Almond which hydrate and provide essential nutrients to make your skin soft and smooth. Our breakthrough herbal sunblock Cinnabloc™*, which is pH neutral, provides effective protection for your skin from the sun's harmful UV rays and prevents light-induced premature skin aging. 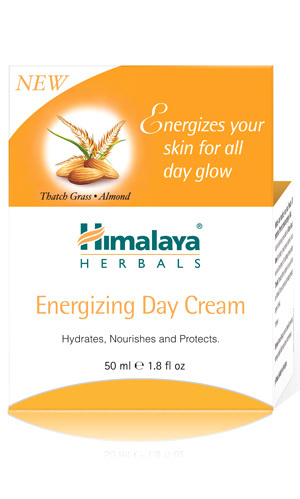 Massage Himalaya Herbals Energizing Day Cream gently on cleansed face and neck, morning and night. May be used alone or under make-up.